DATE/TIME: Wednesdays, May 1 to June 5, 2019; 2:15 to 3:30 p.m. Throughout history, scholars and lay audiences have read and studied this tractate of Mishnah for wisdom and insight into the rabbinic mind. Pirkei Avot (a separate book of 6 chapters) is probably the best know tractate of the Mishnah. 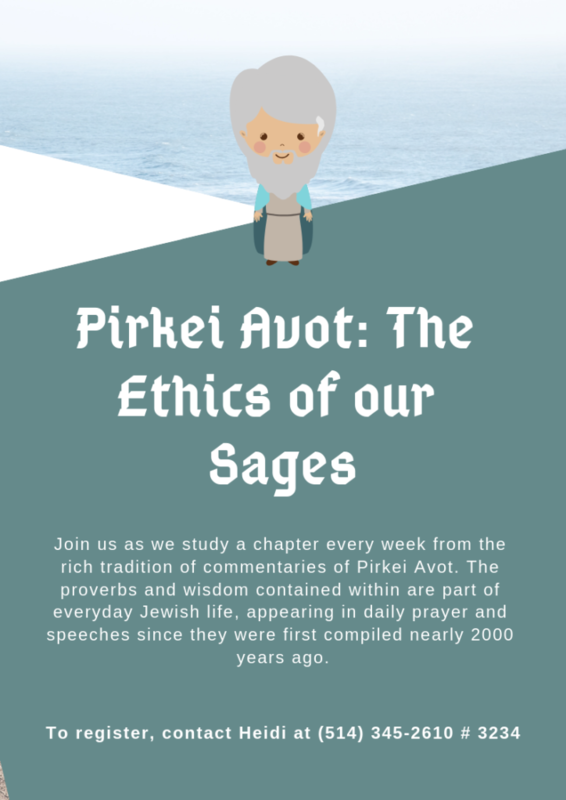 The proverbs and wisdom contained in Pirkei Avot are part of everyday Jewish life, appearing in daily prayer and speeches since they were first compiled nearly 2000 years ago. Join us as we study a chapter every week with a different commentator drawn from the rich tradition of commentaries on this work. All commentaries and texts will be in English and will vary from ancient to modern approaches, including a comic book version! Avi Finegold is a Montrealer who received his rabbinic ordination more than 10 years ago. Until 2013, he worked in adult Jewish education in Chicago, where he taught in the Florence Melton Adult Mini-School and was a guest lecturer at different congregations there. When he returned to Montreal, he founded the Jewish Learning Lab – creating curriculum and educational plans for Jewish organizations. He is also creating programs specifically for adults, to assist the learner in progressing in their Jewish educational world. We are delighted that Rabbi Avi Finegold will be returning to the David Weissman Institute this spring.